What if Tesla licensed it’s technology to all the auto OEMs and become a utility company downstream? Software eats hardware and marketplaces eats industries. Now this is exciting. Watching shorting of equity and an opportunity to disrupt an industry? Ultimately three simple metrics win. 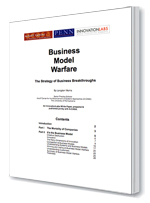 I have been a long proponent of business models and why by just looking at the core of a business, you see the Profit Pool (http://www.bain.com/publications/articles/how-to-map-your-industrys-profit-pool.aspx) and the business model and you get a very good handle on the business, whether startup or a publicly traded corporation.